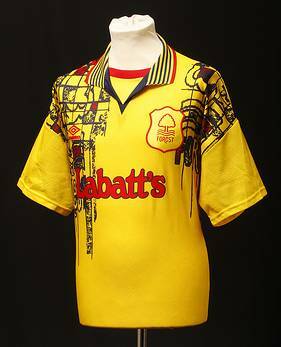 There was a time in the late 1980s/early ’90s when all the various factions of kit designers got together and forged a gentleman’s agreement that they, upon realising things were spiralling dangerously out of control, would all endeavour to strip football shirt design back to it’s bare minimum once again. Unfortunately someone spiked the Ribena. …well, it’s a wonder that the man can still go out in public. Who the hell was their keeper during this period, Jorgé Campos? The thread title could very easily read ‘Every Umbro Goalkeeper Kit Of the Mid-1990s’ as the likes of Man City and Everton were also victims of this fashion crime. Nice to see the yellow peril making an appearance there. Quite possibly the most grotesque shirt ever to grace the famous tricky tree… or looking at the right shoulder, perhaps ‘sicky’ tree. Is Y.M.C.A playing at the top right picture? *See Chelsea too. Blinding efforts.